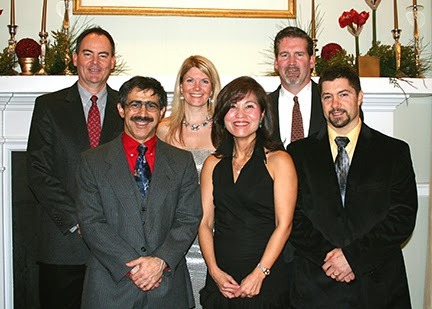 Dr. William Simpson, Dr. Joseph David, Dr. Michelle Bell, Dr. Jae Lee, Dr. Kevin McCarthy and Dr. Demetrius Maoury, of Piedmont Internal Medicine in Warrenton. Fauquier County’s largest primary care medical practice serving teens, adults and senior citizens – Piedmont Internal Medicine – has joined Fauquier Health Physician Services, a multi-specialty physicians group. Piedmont includes six internal medicine physicians: Dr. Michelle Bell, Dr. Joseph David, Dr. Jae Lee, Dr. Demetrius Maoury, Dr. Kevin McCarthy and Dr. William Simpson. The group decided to partner with Fauquier Health after many months of exploration, deliberation and negotiation. Piedmont becomes the 11th medical practice in the network, and the third primary care practice. Fauquier Health Internal Medicine at Lake Manassas and Fauquier Health Family Practice at Bealeton are also members of the group. Specialists included in Fauquier Health Physician Services include: Fauquier Health Endocrinology, Fauquier Health General Surgery, Fauquier Health Hematology/Oncology, Fauquier Health Infectious Diseases, Fauquier Health Neurology, Fauquier Health OB/GYN, Fauquier Health Rheumatology and Fauquier Health Urology. Speaking on behalf of the partners, Dr. Simpson explained the reasons for the merger. “Practicing medicine requires a balance between caring for patients and managing the many outside forces that can interfere with that care. Over the past ten years, that balance has unfortunately been tipping more and more away from patient care. Practices nationwide are being forced to devote more and more resources toward administrative burdens, coming mainly from government and insurance industry demands. This takes time away from patient care. To help restore balance, many doctors are turning to their local health care systems, where there is strength, leverage and economies of scale. For example, one highly trained clerk, dedicated to tackling one major outside intrusion, can effectively assist an entire team of physicians, rather than each of the doctors having to address the problem independently. Fauquier Health and Piedmont Internal Medicine have a long and successful history of working together in many areas, including: physician recruitment; strategic planning; facility expansion; electronic medical record development; medical staff and committee leadership; patient care at the Wound Healing Center; and clinical leadership of Employee Health, The Wellness Center, The Villa at Suffield Meadows and Fauquier Health Rehabilitation & Nursing Center. As part of Fauquier Health’s business strategy, it has acquired the Piedmont Professional Center, where Piedmont Internal Medicine is located. The building’s other occupants – including Fauquier Health Wellness Center and Northern Virginia Dermatology – will continue operations at their current locations as well.